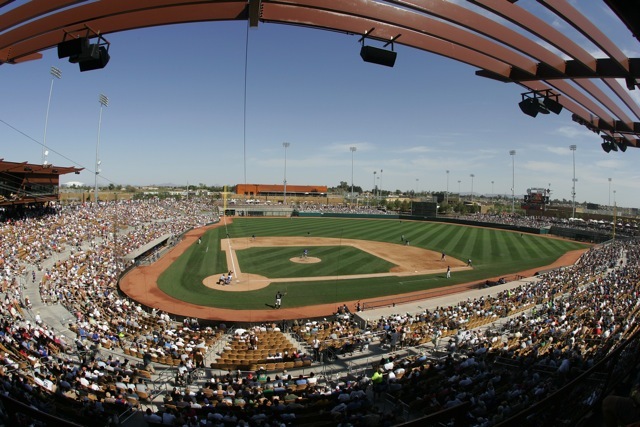 Camelback Ranch-Glendale (CR-G) announces its 2014 schedule of Chicago White Sox and Los Angeles Dodgers Cactus League baseball games. The Dodgers and White Sox begin their sixth spring at Camelback Ranch-Glendale in 2014. The award-winning stadium and campus will welcome fans to 26 games this spring beginning on Thursday, February 27 (Arizona Diamondbacks vs. Dodgers) and concluding on Wednesday, March 26 (Cincinnati Reds vs. White Sox). Two popular day-night doubleheaders are scheduled on consecutive Saturdays — March 8 and 15. The Dodgers and White Sox face each other twice — Friday, February 28 and Saturday, March 15. The Diamondbacks appear at The Ranch three times — Thursday, February 27, Saturday, March 8 and Wednesday, March 12. Also, the defending American League West Division champion Oakland Athletics visit CR-G on Monday, March 10, and Tuesday, March 18. First pitch is 1:05 p.m. MST for all games with three exceptions, the 7:05 p.m. doubleheader night games on March 8 and 15 plus the 7:05 p.m. San Francisco Giants-White Sox contest on Saturday, March 22. Tickets are on sale now! Visit CamelbackRanchBaseball.com or call the Camelback Ranch ticket office (623-302-5000) to speak with a dedicated ticket representative to purchase season, group, mini-plan and suite tickets. Single-game tickets go on sale in January, 2014. To be the first notified of special ticket offers and reminded of the beginning of single-game sales, join the Camelback Insider e-mail blast at CamelbackRanchBaseball.com. CR-G is offering a variety of exciting promotions and offers in 2014. Weekends at The Ranch: At all Friday through Sunday home games, indicated as Weekend Premier games on the schedule. Fans can expect a unique Spring Training experience including live music,roaming entertainers, alumni and legends appearances, and scheduled autograph signings. Weekends on The Legends Deck: New in 2014, at all Weekend Premier games, the upscale Legends Deck will be an all-inclusive ballpark experience featuring ballpark fare and non-alcoholic beverages. The Legends Deck will be hosted by team alumni, who will be available to mingle, pose for photos and sign autographs. The Legends Deck is completely shaded and seats only 100 fans per game. Uptown Alley Family Sunday: Returning after a successful season last year, children ages 12 and under can receive a lawn seat for just $3 at all Sunday games, courtesy of Uptown Alley-Surprise. Limit four (4) discounted lawn seats for each full-price adult ticket. $3 lawn tickets are available on the day of the game, at the box office only. Following the game, children can run the bases like their favorite Dodgers and White Sox players. Spring Break Special (March 18-26): $3 lawn seats for children ages 12 and under (maximum of four discounted tickets per full-price adult ticket). Tickets are available on the day of the game at the box office only. Seniors Stroll the Bases (Every Wednesday): Like their heroes of the past, following every Wednesday home game seniors can stroll the bases. Remember, no sliding! Senior/Military Discounts: Seniors, as well as active and retired members of our Armed Forces, may purchase Infield Box and Baseline Field Box tickets for 50 percent off to all Monday through Thursday games. Tickets are available on the day of the game at the box office only.